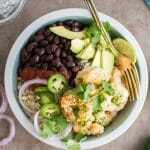 Start your New Year off right with these healthy, Low Carb Cilantro Lime Shrimp Burrito Bowls, topped with black beans, avocado, and salsa. This low carb shrimp recipe uses cauliflower rice as the base, and here you’ll find tips for making the best cauliflower rice. If you love shrimp, but don’t cook it often at home like me, this recipe is a great one to start with! When looking for seafood, I like to look for wild caught – and often it’s difficult to find, or too expensive, so I just skip it. The shrimp in this recipe was a game changer! I’m on a mission to incorporate more seafood in my diet – high in omega 3s and proteins. 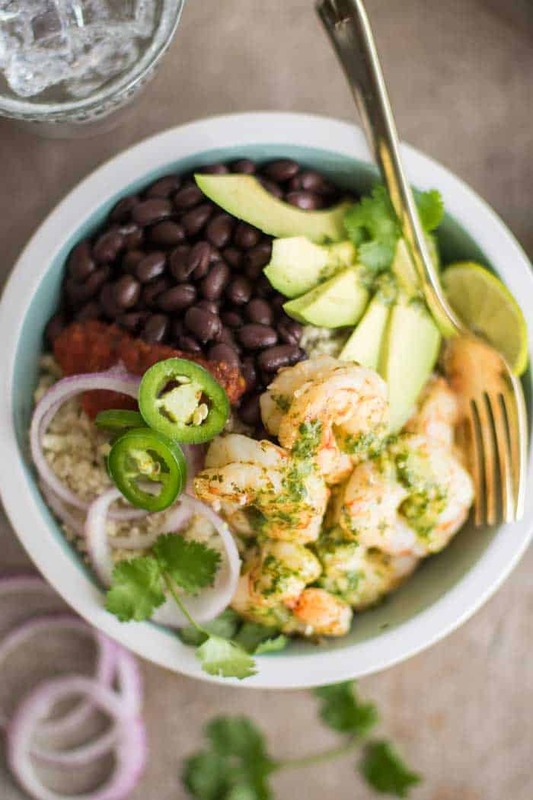 A tasty way to do this is to make shrimp burrito bowls! I was thrilled to be introduced to Marina del Rey shrimp from my friend Robyn over at Simply Fresh Dinners. If you’re looking for a super simple shrimp recipe, check out her Roasted Harissa Shrimp. I wanted this recipe to be full of fresh, vibrant flavors, that would complement how fresh tasting this shrimp is. Good seafood only requires very simple marinades. The great thing about marinating shrimp is that it doesn’t take long. For this recipe, I make the shrimp marinade, pour it over the shrimp, and after I’ve made the cauliflower rice, my shrimp is ready to cook. Leaving shrimp in an acidic marinade for longer than 30 minutes will begin to cook the shrimp – and then you’ll end up with ceviche instead of nicely marinated shrimp. 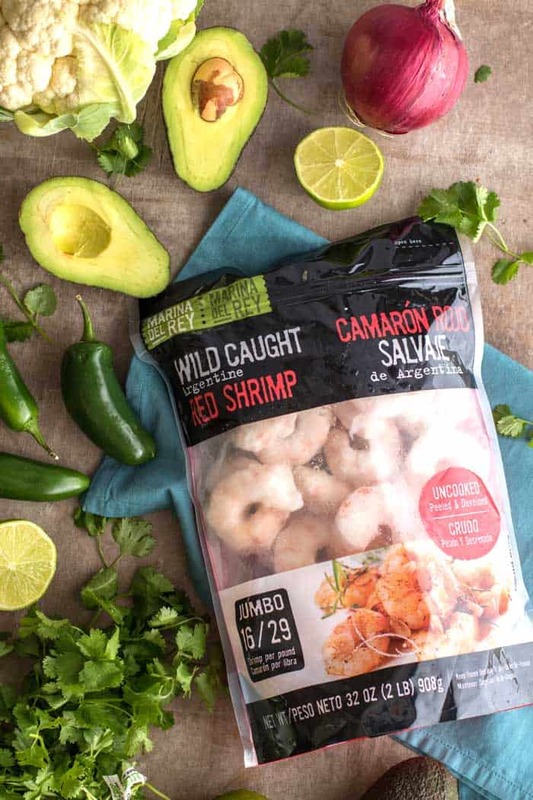 Marina del Rey Wild Argentinean Shrimp comes in easy peel, peeled and deveined, and cooked varieties, so you can choose which option is the best for your recipe. Marina del Rey shrimp is so juicy and flavorful — and the jumbo shrimp is perfect for topping bowls like these! If you’re a shrimp fan, I highly recommend jumping over to their website and checking out their products or looking at their store locator! In the US, it’s carried at all Sam’s Clubs, and it’s in a variety of retailers across Canada. These bowls are kept low carb by swapping rice with cauliflower. If you haven’t tried riced cauliflower, you’re missing out! It’s so simple to make, and the texture is similar to rice, so you won’t miss the real deal at all. That said, I’ve seen some pretty bad batches of cauliflower rice. It can turn out watery and mushy if you haven’t prepared it right. First, chop your cauliflower into fairly small pieces, so it can evenly chop in the food processor. Second, don’t over fill your food processor. If you only fill it about half way, and process your cauliflower in batches, you can evenly chop it. If you process the cauliflower too long, the mixture will start to turn into a mushy watery mess — and you definitely don’t want that. Stop processing when the cauliflower is in pieces the size of rice, or even a bit larger. Last, preheat your skillet on high, and then cook your rice quickly. It only takes a couple of minutes. Use a large skillet (or cook it in batches) so you can spread it out in a fairly thin layer across the pan (again, this helps reduce the moisture so it doesn’t get too watery). Make it Paleo or Whole30: The only thing in this bowl that isn’t compliant are the black beans. It’s easy to omit them, and then try subbing some roasted chunks of sweet potatoes or butternut squash. Chopped olives are easy and would also be delicious. Save Time: Cauliflower rice doesn’t take long to cook, but it is a bit more prep work that just cooking rice. This bowl is still a healthy gluten free option with either brown or white rice. I often making cauliflower rice for myself, but serve my husband and son white rice. Go Crazy: If you really want to do it up, add shredded cheese, sour cream, and guacamole. If you're on the hunt for low carb shrimp recipes, this one is for you! Packed with flavor, and nutrient dense ingredients, like black beans, avocado, and marinated shrimp. Add the marinade to defrosted shrimp. If you're shrimp aren't thawed, it's easy to thaw them by adding them to a colander and running them until slightly warm water for a few minutes. Put the shrimp aside until the rest of the ingredients have been prepared. Heat a skillet over high heat, and add 1/2 tablespoon olive oil. Once the skillet it hot, add the cauliflower "rice". Don't overfill the pan for the best results. It only takes a couple of minutes to cook, so if you need to, just cook your "rice" in two batches. While the cauliflower is cooking, season with cumin and sea salt. Stir the cauliflower frequently, and remove from heat after 2-3 minutes. This looks super easy to make. Love it! Can't wait to try it out for one of my healthy meals :) Keep up the great work. Thanks :) It's such a fun dinner. Isn't their shrimp beautiful? I love it's naturally pink color when raw. So much more appetizing than regular shrimp! 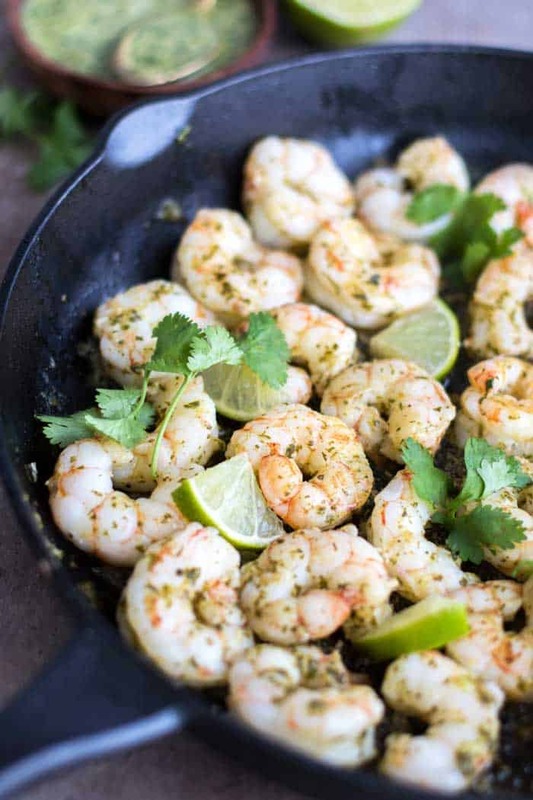 I love this flavorful shrimp Michelle - the marinade must be perfect! 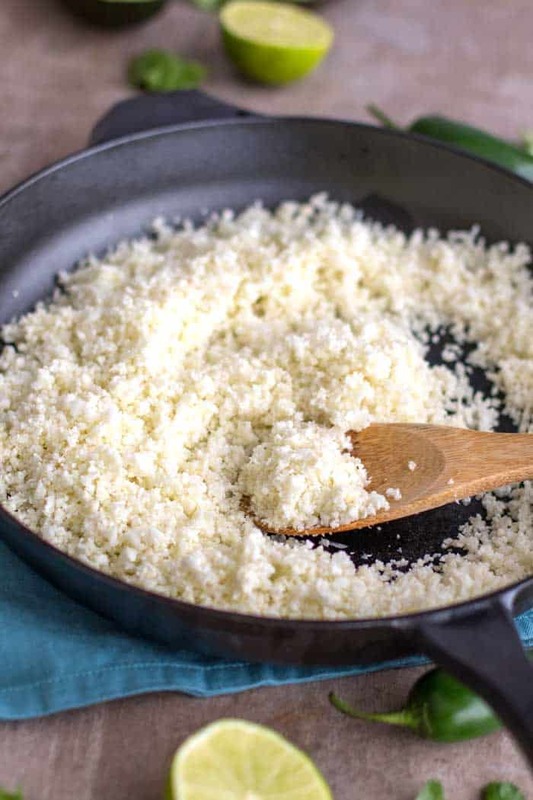 I really want to try your method for cauliflower rice too - it sounds great. We love low carb meals that are quick and easy - thanks! Oh my goodness, I just love this combination of flavors, Michelle, and so glad I was able to share this wonderful product with you!I love cauliflower rice and your tips. Beautiful!Thanks for the shout-out! Michelle I seriously need to meal prep these delicious bowls for the work week!!! SO delicious and healthy! And that sauce!!! I need all of it! Thanks Meggan! It's definitely now my go-to shrimp! Love Marina del Rey Shrimp and this recipe looks delicious!! Can't wait to try it! Thanks Teri! LOVE MDR shrimp! These burrito bowls look so good! I can't wait to make them. And I love that you've used Marina del Rey shrimp. They're our favorite! Hellooooo burrito bowl of my dreams! Such a perfect healthy lunch and I'm loving the cauliflower rice with it! Thanks Jenn! Cauliflower rice is such a great way to lighten up any meal :) And make burrito bowls an acceptable thing to eat every day! This looks like my kind of dinner. Those shrimp look so tender and I LOVE the sauce! It's such a fun and delicious meal -- and MDR shrimp is so tender, and huge -- love how big they are because they stay so juicy! Incredible! I've never tried cauliflower rice before, but heard so much about it. These bowls looks so scrumptious. I just can't wait to give it a try! Yay, I hope you do try it! Cauliflower rice is such a great trick. It is hard to find wild caught shrimp! MDR has raised the bar for shrimp and I don't want anything else, so I always try to have some in my freezer. These burrito bowls look delicious Michelle and I can't wait to try them! 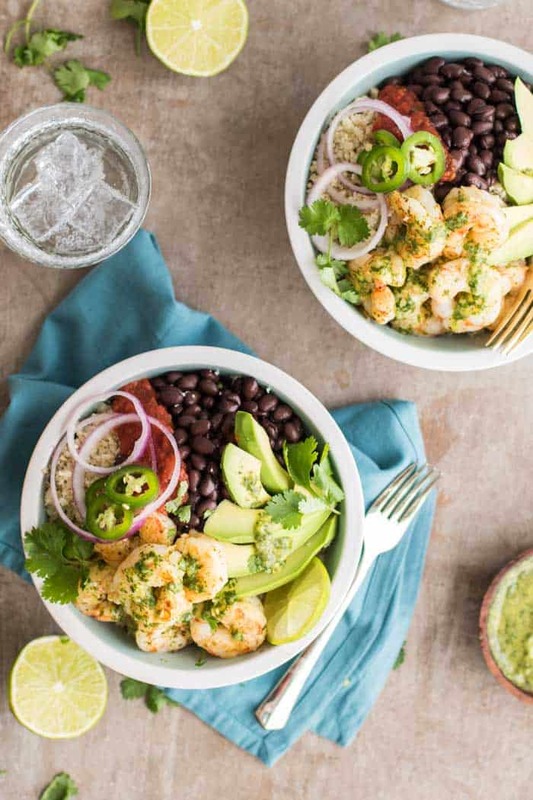 These bowls look so amazingly refreshing, the combination of lime and cilantro has always been one of my favorites ~ and those plump juicy shrimp are calling my name!! Those shrimp are so plump and juicy! The best. My husband is mostly pescatarian and he loves shrimp so I know he'd enjoy these! I fell in love with cauliflower rice the first time I made it. I ended up frying it as a 'fried rice' and fed it to my husband. He couldn't tell the difference;) I think it was my best sub-healthy-for-bad food ever! I did the same with my husband! He had no idea it wasn't rice. It's such a great carb stand-in! 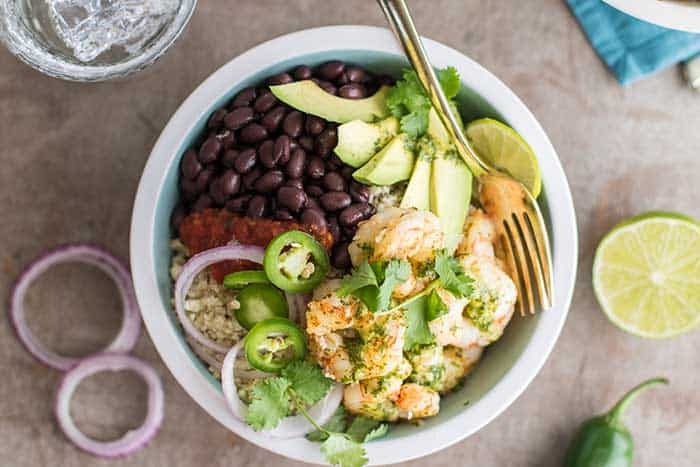 Love this bowl with the cilantro shrimp and cauliflower rice! It's not healthy, but must be very delicious! Lovely! Looks delicious. Are you by any chance interested in doing collabs? I have a few collaboration posts on phlanx collaboration portal, if you're interested you can look me up.